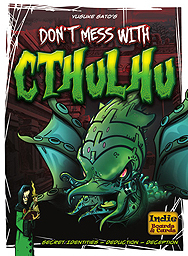 Don't mess with Cthulhu is a fast playing social deduction game with secret identities. Players are either investigators trying to keep Cthulhu from waking and controlling the world, or cultists that want to bring the world to a disturbing end. Nobody knows who is on their team, or who they can trust - each turn has the potential to wake Cthulhu and end the world in an instant. Or will you lose your sanity?